The Cellar Pro 4200VSX wine cellar cooling unit is best suited for external installations. For wine cellars from 1000 cubic feet. Exterior use wine cellar cooling unit for cellars up to 1000 cubic feet. Similar to the 4200VSi but with additional features of exterior hood, coated condenser coils, double-powdercoated case and exterior-grade power cord, thermostatic condensate heating element and 1/2" I.D. drain line. Variable-speed fans with a "high" setting for maximum performance in high-temperature environments (+110°F) and a "low" setting for super-quiet operation. CellarPro's 4200VSx is designed to handle extreme environments and can be used for exterior through-the-wall wine cellar installations in environments up ranging from 40 to 110 degrees. The cooling unit also can be located remotely and ducted with our front duct kit, rear duct kit, bottle probe and remote control display accessories. For installations in environments down to 20°F, we recommend adding our crankcase heater modification to your cooling unit. The cold air intake/exhaust can be ducted up to 100 equivalent feet (50 feet per duct). 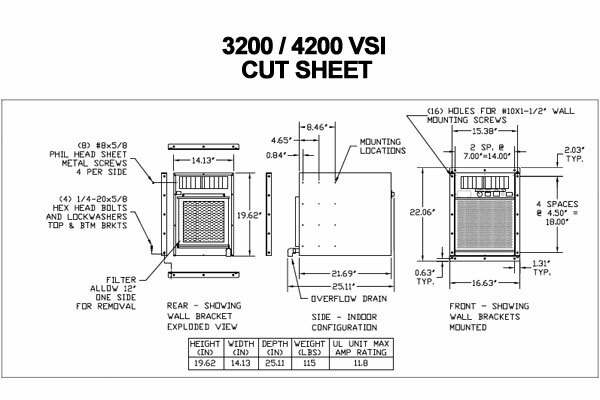 Please Note: The Aluminum Filter upgrade is automatically included with the purchase of a VSX unit.